When I get a new computer, there are several things I install right away, like Microsoft Office and Adobe Creative Cloud. I also install a few free apps you may not be familiar with, and they help me keep my computer organized and find what I need. These apps can be used by anyone with a computer, but my comments below about each are especially geared toward photographers and other creatives. I hope you find these apps helpful! If you try them, I’d love to hear what you think and if they’ve helped you or saved you time. TreeSize is a simple piece of software that will analyze your hard drives and tell you what is taking up space on your drive. RAW files take up a lot of space so this can help you pinpoint how much space your photos are taking up, as well as how much space is being used by other files, like workshop materials, videos, backups, etc. Understanding what is taking up space on your drives is helpful when determining if you need a new drive and what files to move to another drive. It’s also helpful in tracking down files that are wasting space, that you may not realize are even on your computer, like a large folder that you thought had you already deleted or moved. I love this little piece of software for helping me clean up my drive and keep things in check. TreeSize is available at www.jam-software.com. Of the three apps listed here, this tool is probably the one I use the most frequently. With tons of files on different drives and on different folders, it can be hard to find a specific file when you need it. While Windows Explorer has a built-in search function, it is slow and never seems to locate the file I want. But Everything is almost instantaneous, even when searching through large drives with a million or more files. As soon as you start typing part of the file name, it shows you a list of files, which is narrowed down as you continue typing. This is super helpful in locating image files that may be on one of a few different hard drives. Despite our best efforts to save images in an organized fashion, sometimes you’ll need to track down a file that isn’t where you thought it would be. It’s also helpful if you’ve got different Lightroom catalogs and you’re not sure where they all are (search for “lrcat” files). Or you can use it to track down presets, actions, or templates that you may have downloaded but can’t locate. I can’t say enough good things about this little program! Everything is available at www.voidtools.com. For anyone that uses a variety of fonts to design marketing materials or blog graphics, a font management program is essential. You direct the program to any fonts that you have on your computer (installed or not), and it catalogs them. It’s sort of like the Lightroom catalog, except for fonts! You can even save collections of similar fonts to further organize your fonts, like handwriting fonts, chalkboard fonts, etc. NexusFont allows you to quickly view how your text would look in various fonts, so you can choose the one you want and then install the font right from NexusFont. It makes it so easy to compare fonts and find the perfect font for your project. I use this whenever I’m making graphics that include text. There are several programs that do this, but many years ago, I found NexusFont to have the nicest interface of any that I tried, and I’ve been using it ever since. NexusFont is available at www.xiles.net. 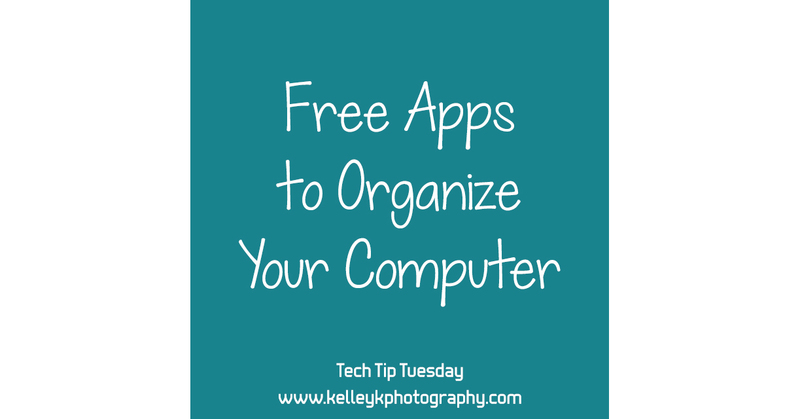 What are your favorite apps to help you keep your computer organized?